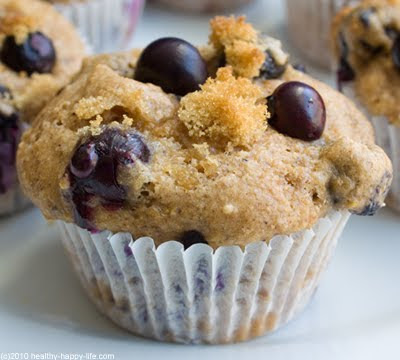 Simple Sweet Blueberry Walnut Muffins. Oil Free. 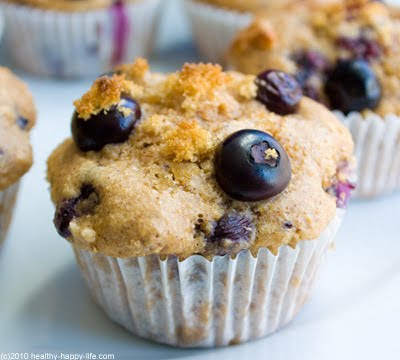 Simple, sweet and healthy, Blueberry Walnut Muffins are the perfect cozy, made-at-home treat. 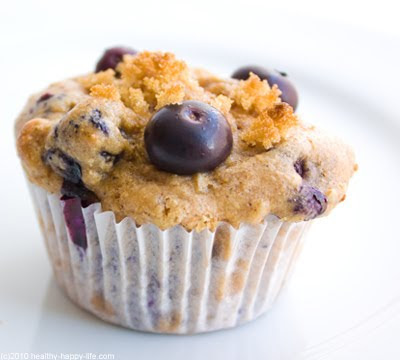 You won't get those warm muffin smells and super fresh fruit flavors from a store-bought muffin. Blueberries and Health. 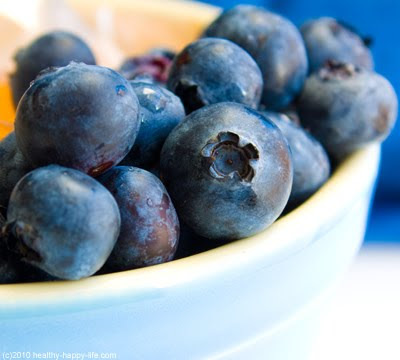 Blueberries are one of the healthiest fruits out there. They are super high in antioxidants, low in calories, fat free, a good source of fiber, sweet, delicious and irresistible. A few stats: blueberries contain (per cup, raw) around 80 calories, 4 grams of fiber, 0g fat, 24% RDA of Vitamin C, 36% RDA Vitamin K and 25% RDA Manganese. Plus blueberries are packed with antioxidant phytonutrients called anthocyanidins - the same phytonutrient found in red wine. Get Inspired. Check out my blueberry photos and kids poem here, to get you in a blueberry mood. Onto these muffins! Or as I call them, moo-fins. Yogurt Note: *You can also use blueberry flavor or plain flavor. If using plain, be sure to add an extra 2 Tbsp of agave syrup to your batter. 1. Preheat oven to 400 degrees. Line muffin tins with paper cups or lightly spray with canola oil. 2. In a large mixing bowl, combine flour, salt, baking powder, cinnamon, sugar and flax seed meal. 3. Add in soy milk, yogurt, apple cider vinegar, orange zest and optional ginger/cayenne. Mix well by hand. 4. Pound out your walnuts (into a dusty meal consistency), and fold the meal into the batter. Then fold in the roughly chopped walnuts. Note: I used raw walnuts, you can use raw or roasted. 5. Wash and pat dry your blueberries. Then toss them in your 2 Tbsp of agave syrup. 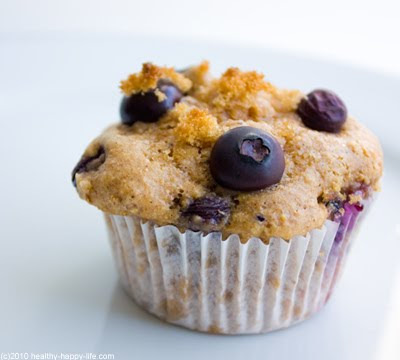 Fold the agave-tossed blueberries into the batter. 6. 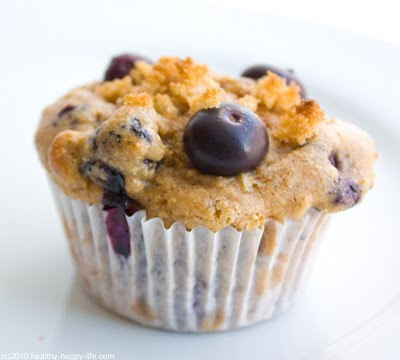 Fill muffin cups, dot each muffin with 2-3 blueberries and a few drops of your crumb topping. 7. Place in oven to bake for 18-23 minutes at 400 degrees. Check center with a toothpick. Tops will brown when ready. Serve: Eat, freeze or store on counter for up to 2 days. 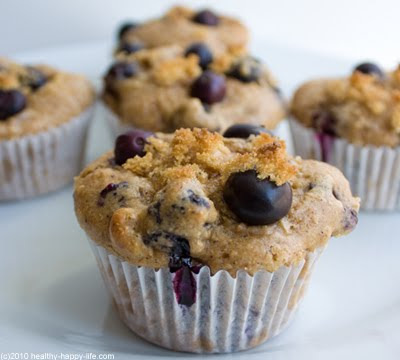 Muffins freeze and thaw very well.